Charles Leslie Thrasher graduated from the Pennsylvania Academy of the Fine Arts in 1909. After a year studying in France, he went to Wilmington where he spent a year attending Howard Pyle’s lectures and refining his skills as an illustrator. 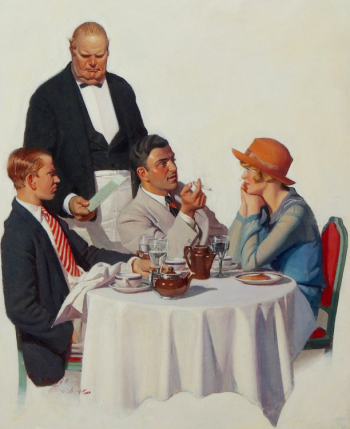 The first of his twenty-three illustrations to grace the cover of The Saturday Evening Post (see all our original Saturday Evening Post Covers) appeared in 1912. During WWI, Thrasher served in France camouflaging tanks and other war machines. After the war, he married Janet Jackson and settled on Long Island near New York. 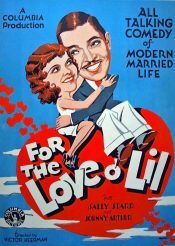 He began providing covers for Liberty Magazine (see Liberty Magazine artwork) in 1920. in 1924, he gained financial security and a measure of fame by signing a long-term contract to produce a cover each week for the magazine. He was to receive $1,000 for each cover. As the presentation was humorous and light, the artwork tended to be lightweight, below the standards of his earlier cover work for The Post, Collier’s, and his advertising illustrations for Cream of Wheat, Fisk Tires and Spaulding. Thrasher’s career came to a tragic end a few days after his home in Old Field, Long Island burned. Rescued from the flames, he developed pneumonia from smoke inhalation and died on 2 December 1936. 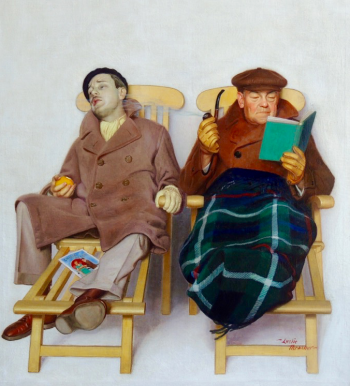 His cover illustration Two Men in Deck Chairs (below) may be the last picture Leslie Thrasher painted before fire destroyed his home and studio. 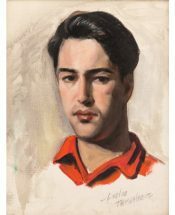 It appeared on the cover of The Saturday Evening Post six weeks after he died from the pneumonia he contracted after the fire. Clever in concept and polished in execution, this work epitomizes the qualities that made Thrasher successful. Ironically, it is one of his best pieces. 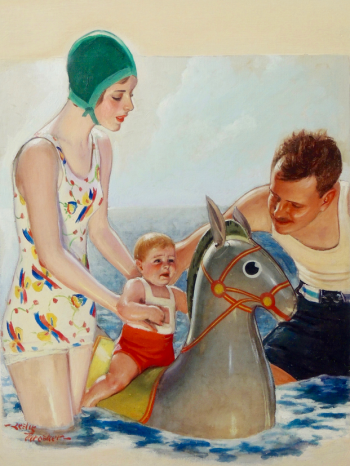 It is interesting to note that although the artist depicted himself in dozens of his American family magazine cover illustrations no photographs of him are to found online. This piece was recently offered as his self-portrait, though. Summer & Beach Themed Illustrations!